Alyssa Miller's Beads of Courage, awarded after each procedure or accomplishment in her cancer treatment, are threaded on a strand nearly 30 feet long. Alyssa's parents, Marv and Maude, say her beads are precious to her. 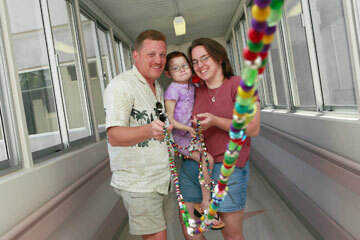 Seven-year-old Alyssa Miller already has endured more than most people do in a lifetime. Diagnosed with a Wilms' tumor in 2004, she has survived 12 surgeries -- including the removal of both kidneys, a liver resection and open heart surgery -- three rounds of chemotherapy and dialysis three times a week. Medications have caused a hearing impairment, and there's an incision that still hasn't healed five months after surgery. Following her latest health crisis, which included 11 weeks in intensive care, she lacks the strength and energy to walk, and allows her parents to transport her to and from the hospital in an oversize stroller. Alyssa Miller died on Thursday, just after this article was completed. Her parents asked that it run in its original form, to recognize the courage she showed in her short life and to acknowledge the hope that Beads of Courage can offer to other children with cancer. "We've taken a very active part in her treatment," said her father, Marv Miller. "Part of that is because you feel so helpless. You try to find ways to bring a smile to her face, but some days, you just can't." What always seems to bring a smile to Alyssa's face, however, is her bead collection. When the nurse presents a variety of beads for her to choose from, Alyssa's shoulders straighten, a grin emerges, her eyes sparkle and she breaks her silence with questions about how many she has earned this time. Alyssa's mother, Maude Miller, said that Alyssa normally lays out all of the beads and narrows her selection to eight or 10. The process can take up to an hour, with mother and daughter conferring along the way. It's all part of a program at Kapiolani Medical Center for Women & Children called Beads of Courage, started in May for pediatric oncology patients, "to acknowledge and honor what they're going through," said nurse Pam Carey-Goo, the pediatric clinical coordinator. The 50 to 60 participants range from babies to age 22. Initiated by Jean Baruch, a nurse in Arizona, Beads of Courage is used in 10 hospitals nationwide, but Kapiolani is the first in Hawaii. 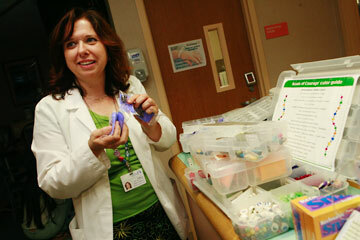 The first thing young patients do is spell out their names with lettered beads. Then they choose a small, round glass bead for each procedure, special accomplishment or event. If they receive chemotherapy, they earn a certain color bead. For radiation they get a glow-in-the-dark bead. There's a different one for staying in the hospital, and especially difficult events, such as losing one's hair, call for a custom-crafted bead in the shape of a head -- with hair. On the last day of therapy, they select a handmade purple heart of courage bead. To accommodate youngsters who had begun their regimen before the program started, nurses sat down with parents and added up the procedures, so each patient could create a strand that accurately depicted his or her course of treatment. "This is something that has helped Alyssa," said Carey-Goo. "It's important to her." Kids string their beads on a black silk cord, to use as a necklace if they wish. But for most the collections are far too long to wear. Some teenage boys have glued theirs to a basketball or a train set, or placed them on wire to create a sculpture. No matter how they are exhibited, the beads become tangible displays of their owners' harrowing journeys. 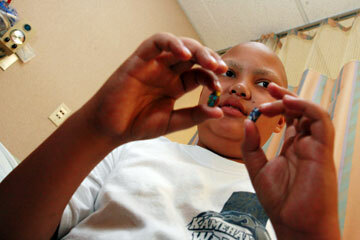 Cheye Mokuhalii, 11, holds two beads he earned after undergoing treatment for Stage 4 Ewing's carcinoma. Cheye has collected more than 200 beads through the Beads of Courage program and says he will keep them even after he gets well. Kapiolani hopes to start a pilot project with siblings, giving them beads to "symbolize how they're helping and what they're going through," said Carey-Goo. Brothers and sisters would collect their own, plus get an additional bead to give to the sibling with cancer, so they have matching sets. A red heart bead starts the set for people who do not have cancer but are involved. This includes professionals at the hospital. "Nurses and other staff members are going through a lot, also," said Carey-Goo. "They fall in love with these kids. And I feel they need to be acknowledged for what they do and what they're feeling." Beads of Courage was a success from the start. "Usually we present staff with new things, like computerized charting," said Carey-Goo. "But this program they embraced right away, and they're very busy." Physical therapists -- whose sessions can be especially difficult for kids suffering from serious illness -- have found the beads to be an extremely helpful source of motivation. "I was thinking, 'This is kind of nice for the kids, and they'll have fun with it,'" recalled Larry Taff, who donated funds to start Beads of Courage with his wife, physician Kheng See Ang. "But it was so touching. We were all choked up. It's much more significant than we thought it would be in terms of how the kids and the nurses feel about it." Carey-Goo agreed. "It's like, 'Look what I've been through.' It's very visual." One glance at Alyssa's strand, which stretches nearly 30 feet, makes that clear. Actually, it should be longer because she has more than 2,600 beads for dialysis (depicted with 26 beads representing 100 each). "Her strand is beautiful, and it really symbolizes her fight against cancer," her mother wrote in an e-mail. "The great thing about this program is that every child who takes on this fight is able to see a physical representation of all that they have been through." Pam Carey-Goo, pediatric clinical coordinator at Kapiolani Medical Center for Women & Children, says the beads symbolize what each child has gone through during treatment. Cheye Mokuhalii, 11, lives on the Big Island but travels to Oahu regularly with his grandmother June Kropfelder to treat a Stage 4 Ewing's carcinoma that began in his lower back. "I used to be in a lot of pain, but chemo has been helping," he said from the lounge in Kapiolani's Pediatric Ambulatory Unit. "I couldn't sit down. I had to stand up all day at school, and I couldn't go in the car." Most of his beads remained at home on the Big Island with his family, but he was happy to share details. Mokuhalii said he'd earned one for losing his hair and eyebrows. And tube insertions? "I got a lot of those," he said. "(The strand) helps me remember the hard times. It helps me be proud of myself because I did something I never wanted to do." On a particularly difficult occasion -- when doctors told him the chemotherapy wasn't working after his first round -- he earned a bead with bumps on it, representing an unusually bumpy time. "We try not to use it as a reward system, but rather as a recognition system," said Brenda Maglasang, a nurse who has worked with pediatric oncology patients for 12 years. "But the beads are more than a diversion. It's also a way for kids to really communicate what they've been through," especially to those who don't understand why patients can't come to school, play outside or be around anyone with a cold. Did he plan to keep the strand of beads forever? "Yeah," said Mokuhalii. "In the future, I can look back and say, 'Wow, look what I've done.' It means a lot." "You can actually see that you were brave," his grandmother added. Maude Miller concurred. One day, she said, this strand "is going to mean a lot to Alyssa." To her parents, it already does.